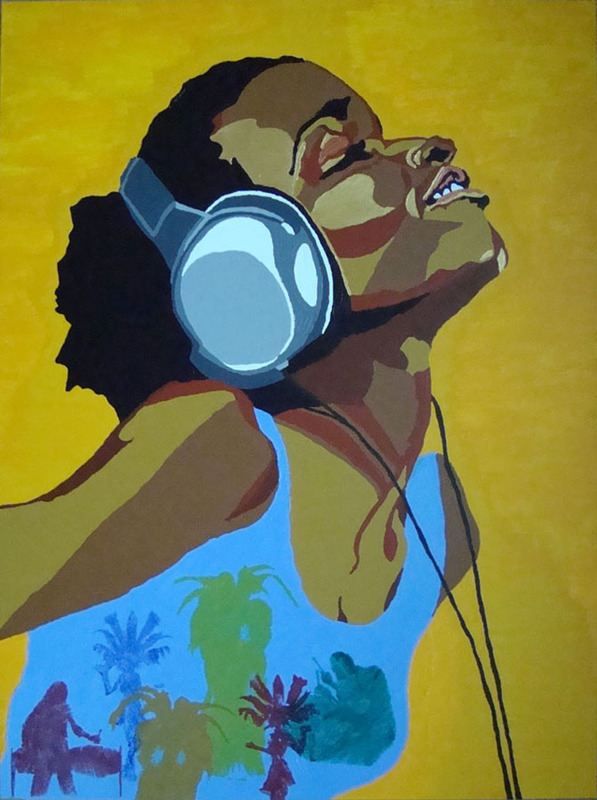 Rachel Natalie Rawlins is a Toronto artist and illustrator who brings life to music and her muses with her paintbrush. Inspired heavily by photography and music, Rawlins has created many unique portraits of singers and other pop culture figures. She says that collecting ideas through photographs is similar to someone covering a song today that came out in the ‘80s. The cover is out of love for the song and a desire to interpret it in their own way. “Different songs can evoke for me a certain mood, vibe, memory and even colour. I am inspired to visually represent what I hear and feel, to make my painting move,” Rawlins says. “I get inspired by the mood of the subjects in photographs, the contrast, and the angles at which they are taken, to tell that story in my own way,” she says . Rawlins is currently working on a series that strays away from her usual portraits of people: she’s turned her focus to animals. “I love the magic and the beauty of the animals in the wild like the lions and the giraffe,” she says. “The theme will be the title of soca songs … the one that I started is of elephants and the title is Stampede,” she explains. Rawlins holding her painting of Andre 3000, an artist, musician and actor (CanCulture/Madi Wong). Rawlins found her passion for art as a teenager. While attending high school in Scarborough, Ont., she decided to pursue art as a career. “I realized work was like a job if you didn’t enjoy it. But if you do enjoy it, it’s more like a feeling of accomplishment,” she says. This decision led her to take a two year digital media arts program at Seneca College, where she was able to learn different artistic techniques, figure drawing, and even to sketch with her non-dominant hand. “It’s just in me to be an artist, by nature,” she says. Though she doesn’t care for labels, Rawlins says, “I do identify as a black woman artist. 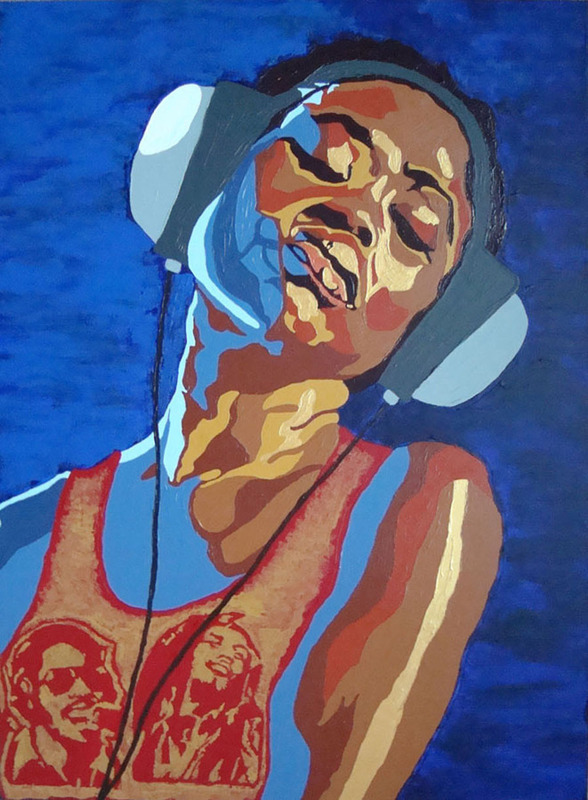 I am an artist who is black, [and] a woman of West Indian heritage, and loves music. And all of those things contribute to and show up in how I am inspired and tell my story artistically,” Rawlins says. Rawlins’ first big show was in 2010 for the “From the Soul” exhibit at the Royal Ontario Museum in Toronto. Rawlins created a unique set of three paintings that portrayed the same woman wearing headphones. Each of the three paintings portrayed a different emotion. She has participated in multiple art shows and galleries where she showcases her pieces alongside of other artists. “I love the feeling of accomplishment after I have completed a piece … and that other people also love and want my work,” she says. In the past, Rawlins has also given back to the community by teaching art classes for kids. She believes that arts are very important in learning, especially for young children. Her work is promoted online and on social media, as well as online sites such as Fine Art America that have enabled her to sell her pieces as mini prints and other accessories. Rawlins’ favourite part about her work is seeing and feeling a piece come together.